« Israel – Still Guessing? • There are also those who not only maintain that the Law (Torah of Moses, Old Covenant) is still in force but if the physical Temple was in existence we would be under the legal requirement of all the Temple rituals including animal sacrifices. What we will do next is endeavor to arrive at a proper understanding of what constitutes the Torah of Moses. We will then determine if in fact the Torah has been completely done away with or if all or any part of it is still applicable. It shall also be demonstrated, among other things, that the Torah given at Mount Sinai was a marriage covenant between Yahweh and the nation of Israel. It must be noted that this particular Torah, referred to as the “Torah of Moses,” “The Law,” and “Old Covenant,” was brought about due to Israelite transgressions against the Abrahamic Covenants of Promise. The Torah of Moses was used to teach the Israelites what sin (transgression) was, thereby revealing in written form the conditions of the earlier verbal Abrahamic Covenants of Promise (Torah of Trust). It basically put into writing those original conditions and augmented them with judgments. In form, the Old Covenant was a marriage covenant between Yahweh and the nation of Israel (Jer. 31:31-32; Isa. 54:5). It was intended to bind the Israelites to the conditions of the Abrahamic Covenants (Torah of Trust) by a written contract that in essence stated: If you do this, then I will do this. The Torah is called the “Old Covenant” to distinguish it from the “New Covenant” of marriage that Yahweh is yet to make with the elect of Israel. Accordingly, the expression “Old Covenant” must not be confused with earlier covenants, such as the “Covenants of Promise” made with Abraham. The Torah (Old Covenant) was established at Mount Sinai, only a few weeks after the Exodus when Israel came out of Egypt, in the third month of that year (Exod. 19:1-2). The precepts of this marriage agreement declared in writing that if the Israelites obeyed Yahweh’s voice and kept his commandments, statutes, and judgments Yahweh would give them the land—from the Suph Sea (Gulf of Aqaba) unto the Palestim Sea (Mediterranean), and from the wilderness (of Sinai) unto the River (Euphrates), i.e., the Promised Land (Exod. 23:20-23). All the people of Israel agreed, and the marriage covenant was ratified (Exod. 24:1-8). Put another way, if the inheritance only went to those who came under the Torah (Old Covenant) and its works, then what worth are the Covenants of Promise given much earlier to Abraham and his seed (the messiah)? Was not the inheritance of this will guaranteed to Abraham because he trusted Yahweh, obeyed Yahweh’s voice, and kept Yahweh’s charge, commandments, statutes, and laws? Did not Yahweh give an oath to fulfill his covenant with Abraham swearing to do so by his sacred name? This statement confirms that the inheritance is not accomplished solely from the Torah given at Mount Sinai, even though the Torah of Moses allows for the inheritance if all of its precepts are kept. Rather, the Covenants of Promise were granted to Abraham and, as with any covenant agreement made by men, it cannot be changed (Gal. 3:15-16). Neither can any scripture be broken (John 10:35), nor would Yahweh change it, for Yahweh does not change (Mal. 3:6; Heb. 13:8). These Covenants of Promise were also confirmed with Jacob a full 430 years before the marriage covenant of the Torah that was made at Mount Sinai (Ps. 105:8-10; 1Chron. 16:14-18; Gal. 3:17). Here’s the logic: since the eternal inheritance was promised in the Abrahamic Covenants of Promise and did not originate in the later Torah of Moses (Old Covenant), the inheritance found in the Torah of Moses must itself somehow be derived from the Abrahamic Covenants of Promise. For example, if a condition of the Abrahamic Covenants is that one must obey Yahweh, Yahweh can later augment that covenant by having his heirs build a Tabernacle and associate with that artifact a priesthood and certain religious services of cleanliness, as long as these works do not contradict the conditions of the original covenant. On the other hand, if a condition of the covenant is that you shall not steal, Yahweh cannot later command that you should steal. Augmentations allow for the establishment of specified customs in dress, foods, and cleansing rites—all found as fleshly works of the Torah—which were meant to keep one ritualistically clean. The expression “works of the Law” was used by the apostle Paul in the first century C.E. to define these augmentations (Rom. 3:20; Gal. 2:16, 3:2, 5, 10). They refer specifically to the purity laws found in the written Torah of Moses (Old Covenant). This detail is confirmed by the fact that this label was given to the contents of a Hebrew manuscript (MMT) written by a contemporary Jewish community located at Qumran. Among the subjects listed under this heading were rulings concerning the cleansing of lepers, the barring of the blind and deaf from the Temple, the restriction of intermarriage with the Ammonites and Moabites, the prohibition of intermarriage between the priests and commoners, the prohibition against plowing with unlike animals, the use of hides and bones of unclean animals, as well as the rules for purification, offerings, sacrifices, and other such things. Therefore, the Torah of Moses (Old Covenant) came about because the Israelites had transgressed the conditions of the Abrahamic Covenants of Promise, to which they were subject. The Torah of Moses, as a result, under a marriage agreement, augmented the requirements of the earlier Abrahamic Covenants of Promise (Torah of Trust). What then were these augmentations and how are they different from the original conditions? And did these augmentations bring into existence things like the festival celebrations and sanctified days of Yahweh or merely dress them with customs? To answer these questions we must examine more precisely what makes up the Torah of Moses (Old Covenant) and why it was considered the proper response to Israelite transgression. It must be recognized that the Torah of Moses (Old Covenant) is a series of covenants. 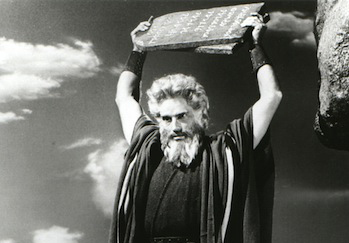 The Torah of Moses was much more than the agreement made at Mount Sinai. Rather, it became a series of handwritten augmentations created because the Israelites were unable to keep their covenant with Yahweh. Also, these augmentations encompassed every­thing from building a Tabernacle and restricting the priesthood to the family of Levi to establishing further covenants, statutes, and laws, including regulations for cleanliness, food offerings, required sacrifices, and burnt offerings. These augmentations developed as follows: To begin with, the Covenants of Promise given to Abraham by Yahweh was in the form of a verbal contract. Nothing was placed in writing. It was backed only by the word of Yahweh. Centuries later, Yahweh reports that he revealed himself to the Israelites while they were in Egypt, requesting them not to defile themselves with the idols of Egypt, i.e., they should obey Yahweh and not commit idolatry (follow other eloahim). In turn, he would bring them into the Promised Land (Ezek. 20:5-7). It is manifest that obedience to Yahweh included obeying his commandments, statutes, and laws which he had earlier included as conditions to the Covenants of Promise given to Abraham. Contrary to the conditions of the Abrahamic Covenants of Promise, the Israelites rebelled by disobeying. Yet, Yahweh did not destroy them while they were in Egypt. He was unwilling to destroy them for the reason of his name’s sake, so that his name would not be profaned among the nations (Ezek. 20:8-9). Put another way, he continued with them because his sacred name was attached to the Abrahamic Covenants of Promise, sworn to by an oath (Heb. 6:13-19). If he failed to accomplish these covenants of giving the Israelites the land as an inheritance then the other nations would speak ill of the worth of Yahweh’s word as sworn to Abraham (Ezek. 36:16-23; Deut. 9:25-29). Yahweh’s name (honor) was at stake! Such statements are important, for we know that Yahweh’s statutes, laws, and commandments were revealed even before the Israelites arrived at Mount Sinai (Exod. 13:4-10, 15:26, 16:28, 18:20). Further, the statement that the Israelites were given knowledge of Yahweh’s Sabbaths in the plural, demonstrates that the high Sabbaths as well as the weekly Sabbaths were meant. Of interest for our discussion is the fact that, among these statutes, laws, and commandments known prior to the Israelites arriving at Mount Sinai, there were those dealing with the Sabbath day, the Festival of Unleavened Bread and Passover of which specific mention is made (Exod. 12:1-51, 13:4-10, 16:4, 22-30). After the Israelites arrived at Mount Sinai, the marriage contract of the Old Covenant was made due to continued Israelite transgression. Also, two important things occurred. • First, the Old Covenant was placed into writing, clearly spelling out what was required. • Second, attached to the conditions of the Ten Commandments were the statutes augmented with the judgments (Exod. 20:1-24:8)—judgments being statutes that render criminal decisions if a required commandment or statute is broken. Previously, only the requirements of the Abrahamic Covenants of Promise were expressed—for example, if one breaks the conditions of the Abrahamic Covenants, he does not receive the eternal inheritance; therefore without the eternal inheritance giving life, one is left with eternal death. With the advent of the Old Covenant made at Mount Sinai, specific types of punishment for breaking these requirements were declared in written form. The authority to continue with further augmentations to the Torah of Moses is also found among the Old Covenant statutes. The Torah of Moses commanded that the Israelites must “guard from the face” of the angel who carries the name of Yahweh (Exod. 23:20-21). Of course, being careful does not mean that one is to listen to the voice of the angel Yahweh if he adds to the conditions of the instructions outside of what was allowed for in the original Abrahamic Covenants of Promise. Such supplements, as we have already proven, are forbidden (Gal. 3:15). For instance, the original statutes found in the Torah of Moses commanded that the Israelites were to keep the Festival of Tabernacles (Exod. 23:16). The “works of the Torah” later augmented this statute with the custom that the Israelites should also sleep in tabernacles (tents, booths) during the Festival of Tabernacles (Lev. 23:39-43). After the incident of the Israelites building the golden calf—thereby committing idolatry and breaking their marriage agreement of the Old Covenant with Yahweh—the angel Yahweh kept augmenting the conditions of the covenant with commandments, statutes, and laws specifying in greater detail what was required. From this process, the “works of the Torah” (e.g., sacrifices, cleansing rites, washings, etc.) also came into existence. For example, after the sin of the golden calf, Yahweh made another covenant with the Israelites (Exod. 34:1-28), and then later added the Levitical regulations. The key point is that the majority of these statutes and laws forming the “works of the Torah” had no severe adverse penalty. To demonstrate, if unclean meat was eaten, the most that would happen is that the guilty person would be declared unclean and unable to attend sacred ceremonies, enter the tabernacle, or remain in the Israelite camp until they became legally clean again. Breaking one of the commandments, statutes, or laws that were also attached to the Abrahamic Covenants of Promise, on the other hand, met with serious consequences which could include death. Nevertheless, the Israelites continued to rebel, once more breaking the statutes and laws and profaning the Sabbaths (Ezek. 20:13). Indeed, Yahweh counted “ten” rebellions from the time he began to bring them out of Egypt until they arrived for the first time at Qadesh Barnea, including their rebellion at Mount Sinai (Num. 14:19-25). For his name’s sake, Yahweh did not destroy Israel, but neither did he bring that generation (those who had left Egypt at the age of 20 years and upward) into the Promised Land (Num. 14:20-24; Deut. 1:34-40, 2:13-17). After the death of almost all of that generation who had left Egypt, Yahweh told the children of the next generation to walk in his statutes and judgments and keep his Sabbaths (Ezek. 20:14-24). Once more they rebelled, this time in the incident at Shittim with Baal-peor (Num. 25:1-26:1). As a result, at the end of a 40-year sojourn in the wilderness, Yahweh “gave them statutes not good and judgments by which they could not live (Ezek. 20:25),” i.e., he made the Deuteronomic Covenant, an augmentation of the Torah of Moses (Old Covenant) which is recorded in the book of Deuteronomy. The Deuteronomic Covenant put in place curses that would come upon the Israelites if they once more failed to listen to the voice of Yahweh and observe his commanded statutes and judgments (Deut. 11:26-32, 27:1-29:1)—the ultimate curse being death (Deut. 30:19). When Moses died, such augmentations ceased to be enacted. The books of Moses were in turn followed by the books of the prophets (from Joshua to Malachi), providing the official history of Israel and prophecies of what will be. Because Israel continued to sin, Yahu Yahweh (Yahushua the messiah) did not enter into his great Sabbath rest in Zion, leaving that entry for a future time (Heb. 3:7-11; Deut. 12:9-11; Pss. 95:9-11, 132:13-14). This concludes the first part of our investigation. Just proceed on to Part 2 whenever you’re ready! This entry was posted on 05/24/2012, 10:37 pm and is filed under Commandments, Grace, Messiah, New Testament, NT Patriarchs, Old Testament, Religion, Salvation, The Law, The Torah, Yahweh. You can follow any responses to this entry through RSS 2.0. You can leave a response, or trackback from your own site. Love the citations from Ezek. 20:1ff. Especially vs. 25 — one of my favorite. Keep riding Silver along that narrow path Ranger. One day I was reading the book entitled “The Festivals and Sacred Days of Yahweh,” and in this book is a wonderful chart on page 56, I think it is. It shows the relationships between the covenants. I always thought that it was a great outline. Maybe it could be posted on your blog if you so wish. Very thorough. While reading the scriptures, it’s important to understand the distinction between the terms used for the Torah. Most “bible readers” are confused. Thanks for the links. It gives me a chance for further study.